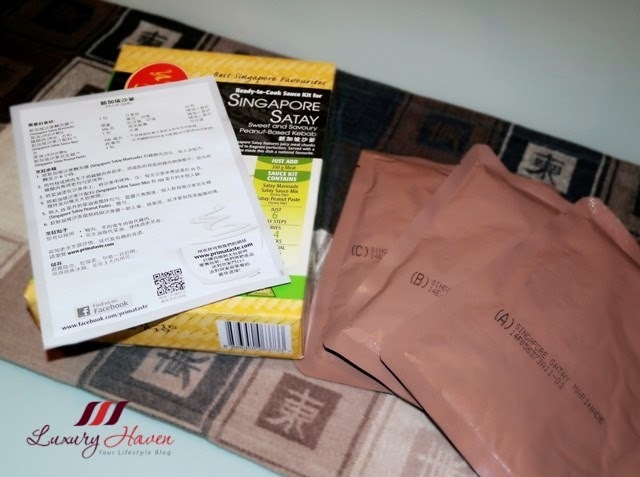 You are here:Home » Recipes » Prima Taste Singapore Satay Meal Sauce Kit Review Is Out! #Satay is very popular in parts of Asia. These bite-sized pieces of meat, skewered on bamboo skewers and barbecued over a flaming charcoal fire are highly sought after. The traditional Singapore Satay ( 新加坡沙爹 ) are mainly using mutton, beef or chicken kebabs, or pork among non-Muslims, and served with onions, cucumbers, and #ketupat ( rice cakes ), accompanied with a spicy peanut sauce dip. 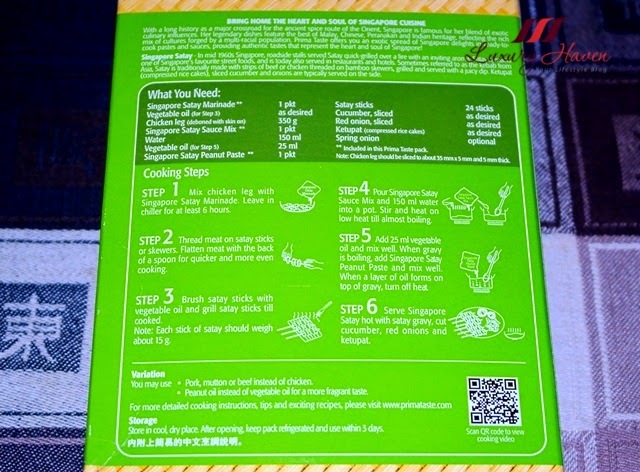 Cooking instructions in the English and Chinese languages. You can even scan the QR code that’s unique to each product which will link you to their various cooking videos! I love the turmeric ingredient used in the satay marinade, giving my chicken meat a characteristic yellow colour. To marinate the satay meat ( I used chicken ), simply mix the meat with the Prima Taste Singapore Satay Marinade and leave in chiller for at least 6 hours; I left it overnight. Thread meat on satay sticks or bamboo skewers. Flatten meat with the back of a spoon for quicker and more even cooking. Although instructions call for each stick of satay to weigh about 15g, I was too lazy to follow that step. Brush satay sticks with vegetable oil or use peanut oil for a more fragrant taste. Since I had some leftover lemongrass from making my tea the other day, I used it to glaze the chicken satay and BBQ the satay sticks till slightly charred. My son always comments that his mummy has no money to buy brushes for glazing. Lol! I also added some pineapple rings to #bbq. 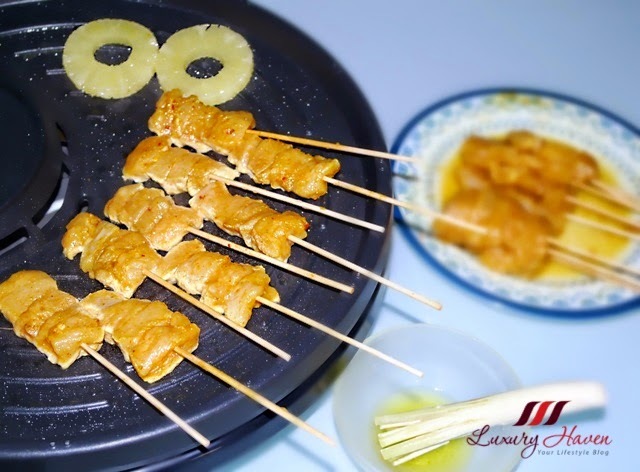 These juicy grilled pineapple rings are a great accompaniment, and they are especially tasty with the Prima Taste Singapore Satay Peanut Dip! Do try adding these fruity rings the next time you have BBQ Satay. Follow the Prima Taste instructions for an appetizing satay gravy. At my first tasting during the preparation of the sauce, I found the sauce was a tad too sweet. But after dipping my satay into the peanut sauce made from ground peanuts and other spices such as galangal, lemongrass, shrimp paste, I couldn't resist taking another dip into the mouth-watering spicy peanut gravy. The satay peanut sauce is rather flavourful, and I like the tinge of spiciness and the crunch from the grounded peanuts I'd added separately. 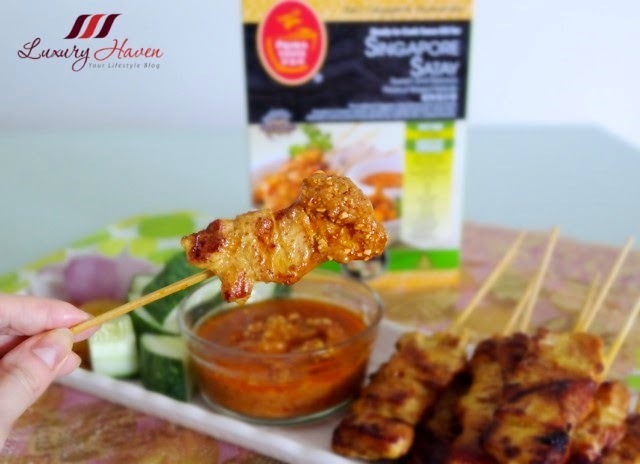 My family loves my tender and juicy char-grilled chicken satay marinated with the Prima Taste Singapore Satay Marinade! After trying the award-winning Prima Taste Laksa LaMian, I was looking forward to tasting their other products and invited my mom over for a BBQ / Steamboat or Hotpot. I am glad I did cause we had a great time, and she loves the food! My mom was comparing to some satay she had bought from a supermarket recently, and lamented it was beyond comparison. She said those satay didn't even taste like satay in the first place and the meat was also tough. She was quite impressed with my satay, and so I gave her the other box of Prima Taste Singapore Satay Meal Sauce Kit since I have two boxes. 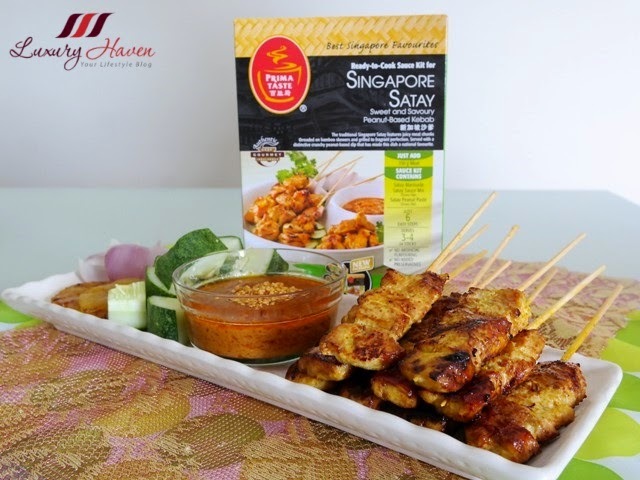 Another thumbs up for Prima Taste Best Singapore Favourites Satay Meal Kit! 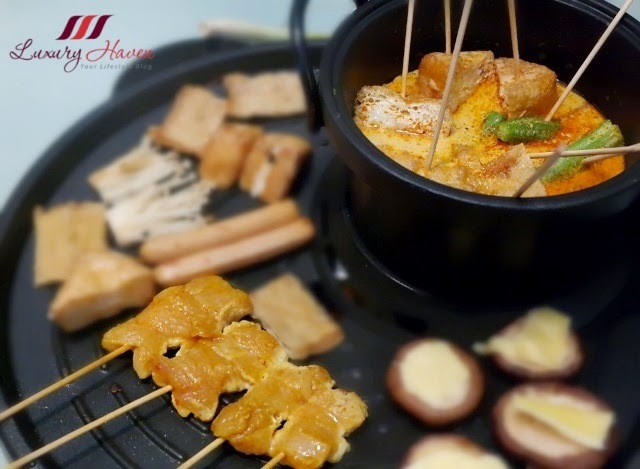 Retailing at just SGD 5.89 to prepare *24 sticks of satay, it is definitely value-for-money! What's more? There are No MSG Added, No Artificial Flavouring, and No Added Preservatives! I mentioned in my previous Review of Prima Taste Laksa LaMian that my family is totally addicted to their ramen despite not being a fan of instant noodles. I wanted my mom to try too, and my son was screaming or more. Guess what I did? I made a Laksa Hotpot!! I love my 2-in-1 BBQ / Steamboat or Hotpot Multi-cooker, and often toying with it. If I have a Japanese meal at home, I would use the griller to BBQ my yakitori and use my hotpot to make a sukiyaki. If I'm in a mood for Chinese, then it's BBQ Yong Tau Foo with traditional Chinese Steamboat. Since I was making satay this time, I use the hotpot for Prima Taste Laksa LaMian! 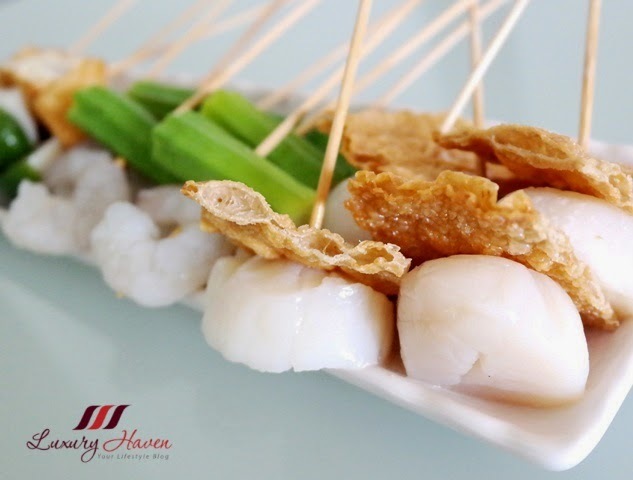 That evening, I used the hotpot to cook the laksa gravy, then added seafood skewers with large Prawns and huge plumpy Hokkaido Scallops plus some other ingredients. 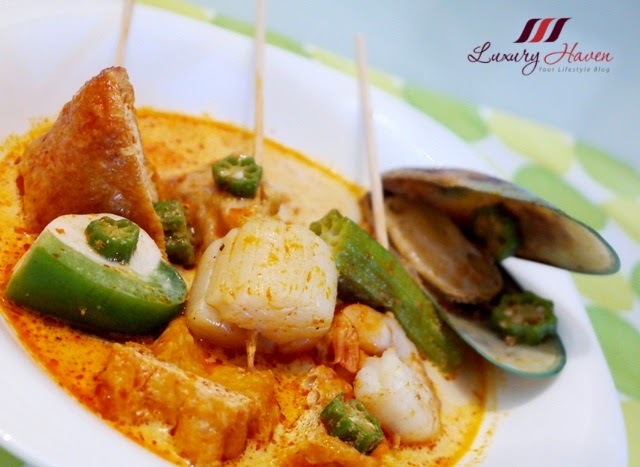 Gosh, the seafood skewers were extremely scrumptious soaking in the laksa gravy! 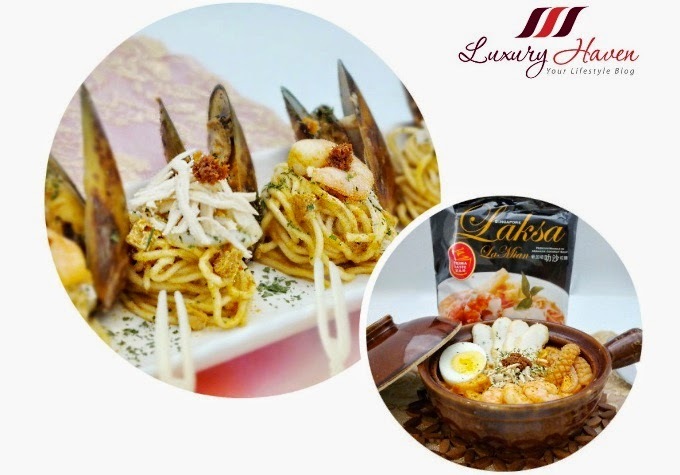 Of course, we also added Prima Taste Laksa LaMian into the hotpot to cook our yummy noodles! 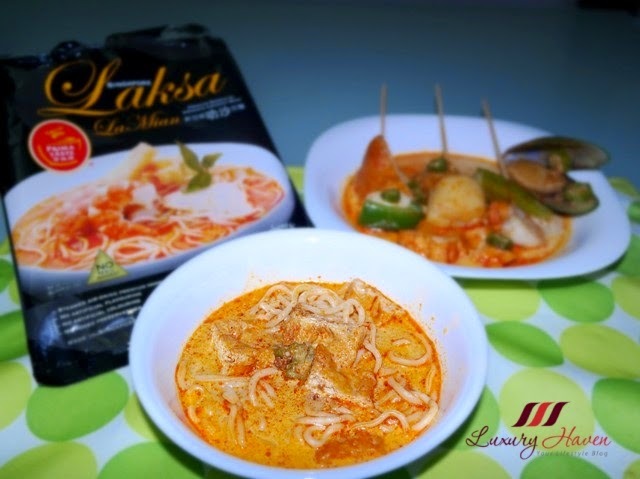 Do you like my idea of the Prima Taste Laksa LaMian and Prima Taste Singapore Satay combination? My family had a great time with my mom, and most importantly, she really enjoyed the dinner. Thank you Prima Taste, for these yummi-licious products! Get a taste of authentic Singaporean cuisine with Prima Taste now! Luxury Haven is pleased to collaborate with Prima Taste bringing you great discounts off their products! Simply quote " LUX0114 " during check-out to enjoy 15% off Prima Taste Online Store! FREE delivery within Singapore with orders of SGD 30 and above! Valid till 21 Dec 2014. Prima Taste ships to anywhere in the world! Do you know that some of their products are also available in the US, and are well received by the taste palate of Americans? For those living in the US, you may wish to purchase Prima Taste products from Amazon. Happy shopping, and I will be back with more reviews on Prima Taste's products! Perfect meal to satisfy anyone. 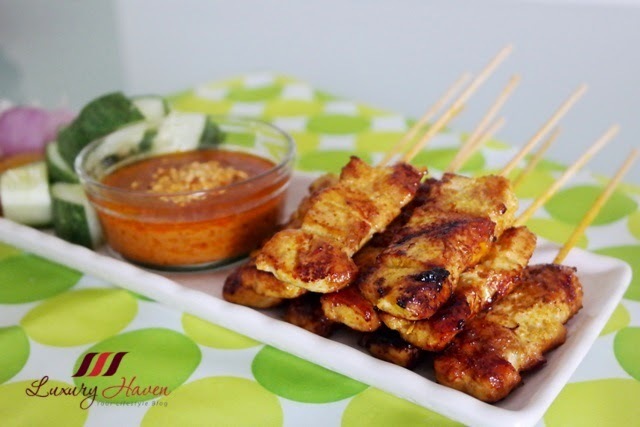 Jackie, satay makes great party dish too! Pepper, it's satay sauce to accompany your own cooking. It's really appetizing, dear! Yap, I've to admit their #primataste laksa is superb! I love the peanuty taste of satay. 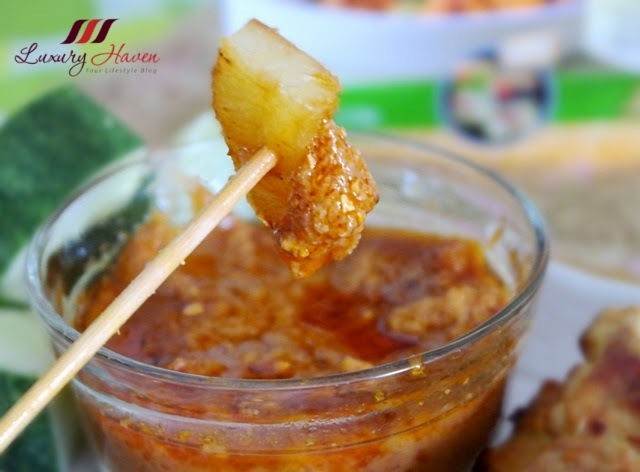 The satay marinade looks like it would be a easy way to enjoy that taste at home. Thanks for sharing Shirley! Rowena, it's really easy to make with the ready-made sauces! I love it! I've never heard about satay. It really looks delicious. Have a great weekend! Jasmine, you gotta try it someday; satay's so yummy! Oh my, home cooked Satay at home? I'll never dream of that, from your picture it look so yummy, looks like Prima really have great products. 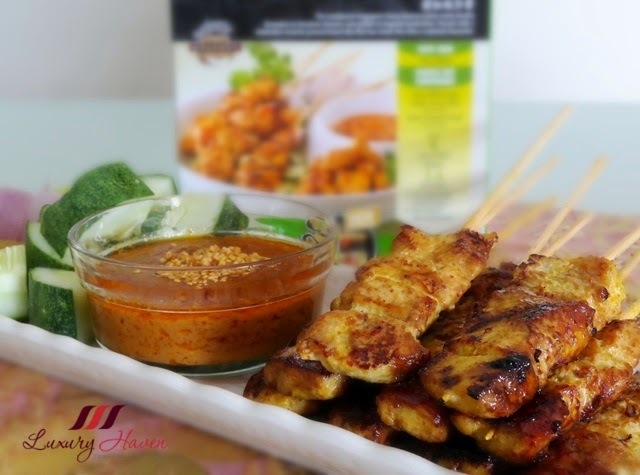 DS, it was my first attempt making satay & it was so easy with the pre-packed sauces! These dishes look so delicious!!! It looks really so yummy!!! Dania, thanks & have a good weekend! Yummmm! I'm definitely more a spicy girl than sweet so I'd up the chili on this dish. Looks sooo divine! Thank you for visiting sweets, would love to get your thoughts on my latest! Julie, I love having a spicy kick as well! Thanks for your thoughts & enjoy your weekend, sweetie! Amy, it's certainly great for novice cooks too! It looks like really delicious!! Paola, thanks & have a good weekend! Louise, these readymade sauces certainly make cooking so much easier. I'm delighted to be given the opportunity to try these yummy products! Interesting. But I prefere cooking myself. Karo, I never believe in using premix stuff but I'm totally captivated by it now. Heehee! This is YUMMY. No joke hun, the pictures and the content of this post have made me hungry. It looks delicious. Rainbow, hahaha! Thanks so much for your wonderful comments, dearie! Elena, hope you'll get the chance to try these yummy food! Delicious! 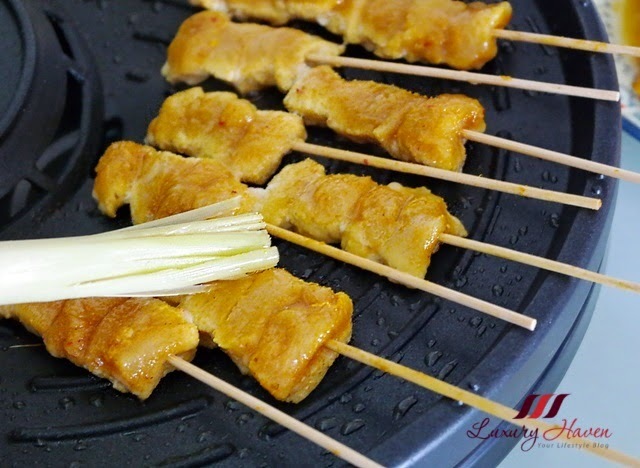 Now can make satay at home without worrying about making the sauce. Is this brand sold in kl? Mun, it's totally cool! I'm surprised how fast & easy it took me to make this yummy dish. Not sure if it's selling in KL, but you can order via Prima Taste online shop & they deliver worldwide! Very attractive displays and the packaging is nice. Lina, Prima Taste is quite a popular brand in Singapore! Lina, I've to admit they make great gifts especially for Singaporeans staying abroad! Oh wow, my family have tried the chilli crab, hokkien mee, lasksa, mee rebus, mee siam but we have never tried the satay! I would love some of your yummy sticks of meat! Serene, totally cool! Have a lovely day, dear! Pineapple! What a great idea! Monica, my family loves the pineapple rings with the peanut sauce! Have a great week end darling. Ania, thanks & happy Sunday! The laksa version is will be my fav. I am screaming for it. Nava, hahaha! I've to admit it's really good! Nice review. Those look so delicious! Yum! Gabrielle, always appreciate your lovely notes! Happy Sunday, hun! Delicious, another one of your mouthwatering post, Shirley. Wishing you a happy weekend dear. Lenya, thanks for showing your support! You've a lovely weekend too, sweetie! this is a quick idea for a meal! Love it! Balvinder, totally fuss-free! Thanks, dear! wow! that's really convenient Shirley! FY, have fun cooking too! yum yum...so at the right time for festive season and also for busy woman who craving for delicious home cook food. Cindy, just perfect for those occasions & I'm sure party guests will enjoy these tasty food! Satay has come out so well. nice quicky meals, simply made our lives better for sure!! !